The patient’s health and well-being are primary. My approach utilizes a mixture of the latest scientific knowledge, clinical experience, and the “art” of medicine acquired by learning from my patients. As a specialist, I bring my expertise in every particular aspect of the patient’s medical concerns. The advantage of being part of a large medical group is that all needs of the patient can be met by appropriate referral under the watchful eye of a primary care physician. My outside interests include biking, reading, playing and listening to music, and traveling. A visit with Dr. Freedom is like being with a good friend. He is extremely caring. DR. Freedom has always taken the time to explain and offer options for my care of Cluster Headaches. A scheduled annual check-up became a thorough exam and conversation about new issues. I was so grateful for the time, concern, and attention to my issues. Dr Freedom is a great doctor and a very nice person!! 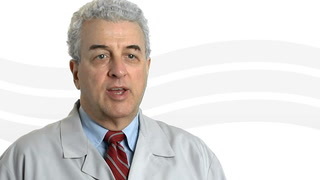 Dr. Freedom is a very knowledgeable and experienced person. He taook his time to explain the results of my study and very patient. He makes you feel at ease. Of all our NorthShore doctors, *Dr. Freedom is the most kind and caring. 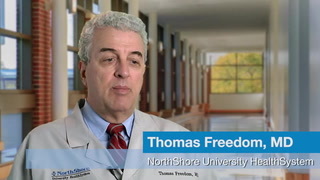 Dr. Freedom is a caring and extremely knowledgeable neurologist. Always helpful, patient and informative. Amazing, absolute attention & answers all my questions and concerns. Very highly recommend *Dr. Freedom. Design and implementation of pragmatic clinical trials using the electronic medical record and an adaptive design. To demonstrate the feasibility of pragmatic clinical trials comparing the effectiveness of treatments using the electronic medical record (EMR) and an adaptive assignment design. We have designed and are implementing pragmatic trials at the point-of-care using custom-designed structured clinical documentation support and clinical decision support tools within our physician's typical EMR workflow. We are applying a subgroup based adaptive design (SUBA) that enriches treatment assignments based on baseline characteristics and prior outcomes. SUBA uses information from a randomization phase (phase 1, equal randomization, 120 patients), to adaptively assign treatments to the remaining participants (at least 300 additional patients total) based on a Bayesian hierarchical model. Enrollment in phase 1 is underway in our neurology clinical practices for 2 separate trials using this method, for migraine and mild cognitive impairment (MCI). We are successfully collecting structured data, in the context of the providers' clinical workflow, necessary to conduct our trials. We are currently enrolling patients in 2 point-of-care trials of non-inferior treatments. As of March 1, 2018, we have enrolled 36% of eligible patients into our migraine study and 63% of eligible patients into our MCI study. Enrollment is ongoing and validation of outcomes has begun. This proof of concept article demonstrates the feasibility of conducting pragmatic trials using the EMR and an adaptive design. The demonstration of successful pragmatic clinical trials based on a customized EMR and adaptive design is an important next step in achieving personalized medicine and provides a framework for future studies of comparative effectiveness. Structured Clinical Documentation to Improve Quality and Support Practice-Based Research in Headache. To use the electronic medical record (EMR) to optimize patient care, facilitate documentation, and support quality improvement and practice-based research, in a headache specialty clinic. Many physicians enter data into the EMR as unstructured free text and not as discrete data. This makes it challenging to use data for quality improvement or research initiatives. We describe the process of building a customized structured clinical documentation support toolkit, specific for patients seen in a headache specialty clinic. The content was developed through frequent physician meetings to reach consensus on elements that define clinical Best Practices. Tasks were assigned to the care team and data mapped to the progress note. The toolkit collects hundreds of fields of discrete, standardized data. Auto scored and interpreted score tests include the Generalized Anxiety Disorder 7-item, Center for Epidemiology Studies Depression Scale, Migraine Disability Assessment questionnaire, Insomnia Sleep Index, and Migraine-Specific Quality of Life. We have developed Best Practice Advisories (BPA) and other clinical documentation support tools that alert physicians, when appropriate. As of April 1, 2018, we have used the toolkits at 4346 initial patient visits. We provide screenshots of our toolkits, details of data fields collected, and diagnoses of patients at the initial visit. The EMR can be used to effectively structure and standardize headache clinic visits for quality improvement and practice-based research. We are sharing our proprietary toolkit with other clinics as part of the Neurology Practice-Based Research Network. These tools are also facilitating clinical research enrollment and a pragmatic trial of comparative effectiveness at the point-of-care among migraine patients. Headaches and sleep disorders are associated in a complex manner. Both the disorders are common in the general population, but the relationship between the two is more than coincidental. Sleep disorders can exacerbate headache sand the converse is also true. Treatment of sleep disorders can have a positive impact on the treatment of headaches. Screening for sleep disorders should be considered in all patients with headaches. This can be accomplished with brief screening tools. Those who screen positively can be further evaluated or referred to asleep specialist. Many patients with headache disorders have coexisting sleep difficulties. As both conditions are relatively common, they could potentially be present simultaneously, even if unrelated. However, there is evidence that a comorbid association between headache and sleep disorders exists. Clinical heterogeneity of patients with complex sleep apnea syndrome. The definition of complex sleep apnea (CompSAS) encompasses patients with obstructive sleep apnea (OSA) who develop central apnea activity upon restitution of airway patency. Presence of arterial hypertension (HTN), coronary artery disease (CAD) and heart failure (HF) have been proposed as risk factors for CompSAS among OSA patients. Using our database of patients with CompSAS, we examined the prevalence of these risk factors and defined other clinical characteristics of patients with CompSAS. Through retrospective search of the database, we examined the medical and clinical characteristics of consecutive patients diagnosed with CompSAS between 11/1/2006 and 6/30/2011 at NorthShore University HealthSystem. One hundred and fifty patients with CompSAS were identified. Among patients included in the study, 97 (64.7 %) had at least one risk factor for CompSAS, while 53 (35.3 %) did not have any of them. Prevalence of low left ventricular ejection fraction and hypocapnia were low. Therapeutic interventions consisted of several positive airway pressure therapies, mainly adaptive servo ventilation. A hundred and ten patients (73.3 %) complied with recommended therapy and improved clinically. Although most patients with CompSAS have cardiac comorbidities, about one third of patients do not have any risk factors of CompSAS prior to sleep testing. Further research on factors involved in development of CompSAS will allow for better tailoring of therapy to pathophysiology involved in an individual case. Trials of bilevel positive airway pressure - spontaneous in patients with complex sleep apnoea. Patients with complex sleep apnoea (CompSAS) have obstructive sleep apnoea and experience persistent central apnoeas when exposed to positive airway pressure. Elevated loop gain is one of the postulated mechanisms of CompSAS. We speculated that bilevel positive airway pressure - spontaneous (BPAP-S), by producing relative hyperventilation, may more readily produce CompSAS activity than continuous positive airway pressure (CPAP). If found to do so, a trial of BPAP-S might be a simple way of identifying patients with elevated loop gain who are at risk for CompSAS. Thirty-nine patients with complex sleep apnoea were included in the study. Segments of NREM sleep on CPAP and BPAP-S matched for body position and expiratory airway pressure (comparison pressure) were retrospectively analysed. Correlations between clinical and demographic variables and polysomnographic response to CPAP and BPAP-S were sought. There was no difference in any of the polysomnographic indices on CPAP and BPAP-S. In 19 patients the use of CPAP was associated with lower AHI at the comparison pressure; in 20 patients the opposite was true. No clinical variables correlated to the differential response to CPAP vs. BPAP-S.
BPAP-S was not more effective than CPAP in stimulating complex sleep apnoea activity.